I got a little stamping time in late last night after everyone went to bed. Woohoo! 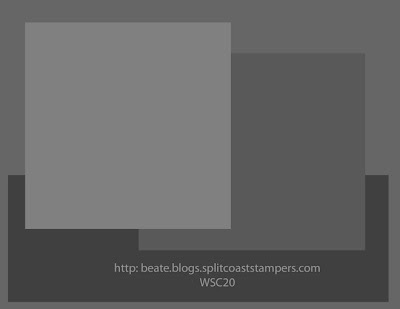 Luckily, Beate had just posted this week's SCS Featured Stamper Challenge (FS34), featuring the gallery of Jenn Balcer. You can view Jenn's SCS gallery HERE. She is one talented lady! I was drawn to THIS CARD of Jenn's to CASE for the challenge. I think what drew me in was Jenn's use of Elegant Eggplant, a color I haven't used in a very long time. I defenitely wanted to use Elegant Eggplant, but wanted to change it up a bit, using a color combination I've never used before. With the help of THIS SU Color Combo website, I stumbled across my color combo of Elegant Eggplant, Apricot Appeal, Sage Shadow, and Basic Black. I really liked the way Jenn used the "inside" sentiment on the outside of her card .... I never think of doing that! I always think of the sentiments from In My Thoughts as ones that would normally be used for the inside of a card. Love it when stampers think outside of the box that I always seem to be on the inside of! The things I changed from Jenn's card: a) color combo, but inspired by Jenn's use of Elegant Eggplant, b) stamp set ... mine uses Bud Basics and Basics Outline Jumbo Wheel, c) I mocked Jenn's "scallop" border across the bottom of her card. She used the Polka Dots & Petals stamp set for a scallop look, and I used the Slit Punch on Apricot Appeal CS for my scallop, d) different sentiment, but same stamp set (In My Thoughts). My apologies for lack of posts this week, and for lack of original artwork. What LITTLE time I've had to stamp has been stamping for my upcoming stamp class (and I try to keep those projects a surprise for my local stampin' friends). As I've mentioned before, my mom has been here for two weeks recovering from surgery. In between helping her (which I'm very much enjoying! ), driving kids to and from schools and activities, laundry, grocery shopping, cooking, and TRYING to keep the house fairly clean, there's been NO chunks of time for some serious stamping! Bummer!!! Drew joined a tackle football team and is taking guitar lessons, and Allie's marching band season is in full force. I can't tell you how many trips my husband and I make in one day back and forth from schools and activities ... it just plain NUTS! I can certainly tell October is approaching! Seems like October, December and May are always CRAZY months at the Riley house! (Now that I think about it ... when ISN'T it a crazy time at the Riley house?). Bear with me ... I am trying really really hard to get some stamping time in! I have a photo folder on my computer for photos of cards and projects I find in various places. I totally CASEd this altered fruit can from Sarah Moore. See her original HERE. This can was originally a Del Monte 4 oz. can of fruit. I opened it from the bottom with a Pampered Chef Can Opener which opens cans without the sharp edge. After taking the fruit out, wash the can and remove the label, decorate, fill with Halloween goodies, and glue the bottom lid back on the can. E6000 glue works well for this, and can be found at your local craft store and Walmart. I did use the retired Stampin' Around Wheel, Boulder Bits, and some of last year's retired Halloween Night DP and ribbon for this can. My all-time favorite Halloween character has got to be Frankenstein, and love it when green and purple are added to the traditional orange and black colors for Halloween! This is a tag from Michele Force, The Stamping Link. Take time to visit her blog ... you will truly be inspired by her fabulous artwork! 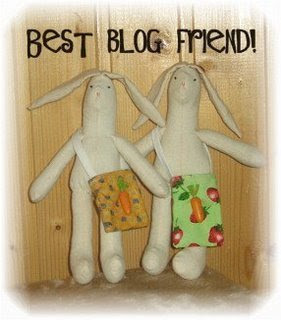 I received this Best Blog Friend Award from Roxy, Stamping With Roxy. Roxy's blog is jam-packed with incredible stamping ideas, and her award-winning enthusiasm is contagious! HOLY SMOLLY MACARONI! (this is a term Roxy uses when she's really excited about something, which is often!) She's so funny! The minute I saw the THANKFUL GARLAND in the 2007 Holiday Mini Catalog, I knew I HAD to duplicate it! With some helpful advice from Jan Tink (see her garland HERE), and a few changes to accomodate my available supplies ... ta da !!! Jan created a gorgeous "NOEL" garland from the same On Board Garland Greetings. I've got big plans to case that one too! The catalog even makes suggestions for "JOY" and "JOYFUL" garlands. HERE is a "JOY" garland on Fran Sabad's blog, using embossing powders and glitter. The possibilities with the On Board Garland Greetings chipboard assortment are endless! I had high hopes of offering this project as a class, but after the amount of time I spent completing mine, that idea was immediately scratched! I love the end result, and know I will enjoy displaying the garland in my home during the Thanksgiving holidays for years to come! d) there are some words on the leaf chipboard located on the letter "L"of the catalog's version.... my chipboard leaf is slightly different, and chose not to include the words. If you would like to complete this project, your KEY TOOL is an exacto knife! Notice that all the the letters except the "A" and the "U" use the NEGATIVE to the letter. In order to cover them with designer paper, place the right side of the negative chipboard piece to the wrong side of the DP, trace with a pencil, and use an exacto knife to cut it out. Your cutting doesn't have to be perfect because you will use the sanding block to rough up the edges for a distressed look. I did buy a fine sanding sponge at the craft store that I was able to cut into small sections in order to sand the hard-to-reach areas. The cutting and sanding is what took the majority of the time in creating the garland ... the embellishments are fairly simple. Today's Featured Stamper (FS33) on SCS is Kristina Werner, aka starofmay on SCS. Kristina's gallery and blog, KWERNERDESIGNBLOG are AMAZING! I just love Kristina's clean, crisp stamping style! Wish I had all day to case her work! I especially like Kristina's photography skills! Her blog is so professional looking, and her photography showcases her artwork beautifully! I cased two of Kristina's cards. See her original of this card HERE. To achieve the three "windows" in the Certainly Celery CS (3 1/2" x 4 3/4"), I punched three Post-It Notes with the 1 3/8" Square Punch, making sure to include some of the sticky portion of the Post-In Notes. I then placed the three Post-It Note square evenly on the Certaily Celery CS, and punched again with the 1 3/8" Square Punch. The Certainly Celery frame piece is mounted on dimensionals for depth. The flowers from the Priceless stamp set are stamped on the Whisper White background piece, stamped again on another piece of Whisper White, cut out, and raised on dimensionals. Technique: Paper Piercing, Distressing around "MEMO" piece. This card is for Beate's Weekend Sketch Challenge #20, and uses many products from Stampin' Up! 's 2007 Holiday Mini Collection (see recipe below photo). Purely Pomegranate and River Rock are difficult to photograph! The colors look different on my computer monitor versus my husband's monitor. The Gold Elastic Cord around the chipboard star looks odd in the photograph. It really does look better IRL! It is just crossed around the star, then tied in a bow. The new Elastic Cord is so-o-o much easier to work with than the retired cording! 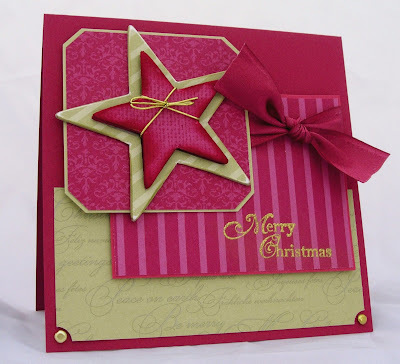 The chipboard stars from On Board Garland Greetings are covered in Holiday Harmony DP. The "Merry Christmas" sentiment is embossed with Gold EP. The new Satin Ribbon from the Holiday Mini is gorgeous! ... very elegant .... and also comes in Chocolate Chip! Note: Card size measures 5 1/4" x 10 1/2", scored at 5 1/4". The day before my birthday in July, John (DH) told me that he hadn't gotten anything for me for my birthday. One might think that is pretty lame, but after 17 years of marriage, John knows I'm a girl that appreciates USEFUL items as gifts. Sure, it would have been easy for him to order flowers, but he knows I'm really not a flower kind of a person when it comes to OUR pocketbook! I told him that he knew what I wanted (I had only mentioned it a several times in the weeks prior!). Of course, typical guy ... he had no clue what I was talking about! I wanted an Ink Pad Storage Unit from Storage Units Ink! Luckily, I had several ebay auctions end that day and had the money to pay for my own birthday present! John's response: "Perfect! Order it!". It is was done! Thank you, honey! Denise Wenzloff and her husband offer a full line of HIGH QUALITY, HANDMADE WOOD STORAGE UNITS for rubber stampers. Denise's husband has a full time job during the day, and handcrafts these beautiful units in the evenings and on the weekends. In July, Storage Units Ink had a discounted price on their units, and were bombarded with orders. That is why I am just now receiving my unit. Let me tell you, it was so-o-o worth the wait!!! I got the Wall Unit Plus which holds 60 Ink Pads, 60 Re-Inkers, and 60 Stampin' Write Markers! OMG!....it is so nice to have my Re-Inker and Marker right next to the coordinating Ink Pad! Love it love it love it!!! This unit hold all of my 48 Stampin' Up! Classic Colors, 6 Neutrals, and 6 Current In Colors. The quality of workmanship is incredible ... it is just perfect in every way! This is my Wall Unit Plus. Notice I can even display some of my artwork on top of it! I've been stamping for several years, so some of my ink pads are still the OLD SU style, which I am slowly replacing with new. Until then, I'm going to use my Dymo labeler to label the outside SIDE of the old style pads. I also own the Stampin' Up! Color Caddy with Extender Kit (pg. 193) ... which I also love! I really needed something that didn't take up the "round space" on my workspace that the Color Caddy did. I've moved the Color Caddy to my nearby shelf and use it for my Craft Ink Pads, Versamark, Encore, Staz-On, and duplicate Classic Ink Pads, etc. I've had several requests for Paula's Amish Friendship Bread from this post. Paula was kind enough to share her recipe for the Starter, and for the Bread. This is a true labor of love and incredibly delicious! Thanks, Paula!!!! Soften active dry yeast with 1/4 cup warm water for 10 minutes. Stir with a wooden spoon. In a non-metal bowl, combine 1 cup flour and 1 cup sugar. Mix, slowly adding 1 cup warm milk and the softened yeast. Cover loosely with clean cloth and leave at room temperature until bubbly. When mixture has lots of bubbles, cover with plastic wrap and refrigerate. Stir with a wooden or plastic spoon (don't use a metal spoon) until mixture is smooth. Do this once each day. At this time, 2 cups of starter can be removed from the batch to bake Amish Friendship Bread or use in your own recipe which calls for starter. ****Replenish starter by stirring in 1 cup flour, 1 cup sugar, and 1 cup milk; stir; allow to sit at room temperature for 1 hour, then refrigerate. **This would be day 6 on the Friendship Bread Recipe below. You only add this step one time on day 5 or 6. Day 10: BREAD BAKING DAY! 1st ) Pour the entire contents of the bag into a bowl. 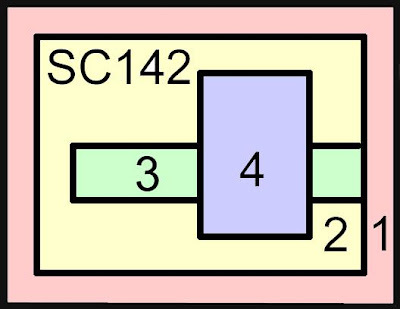 Add 1-1/2C. Flour, 1-1/2C Sugar & 1-1/2C Milk. Greese 2 large loaf pans. Mix an additional 1/2 cup sugar and 1-1/2 tsp. cinnamon, dust the greased pans with half of the cinnamon mixture. Pour batter evenly into the 2 pans. Sprinkle the remaining surgar mixture over the top. Bake for 1 hour ( I start checking the bread after 50 minutes). Cool untill bread loosens evenly from the sides of the pan. I've been tagged by Kathleen, My Happy Place. 2) Landstrom Photography (candid party photography for fraternity/sorority parties/keggers/dances, etc.) WILD!!! 4) There isn't a #4 .... those are the only three places I've lived! This week, I combined two SCS challenges, Color Challenge 132 and Sketch Challenge 142. The color challenge was to use the colors of CHOCOLATE CHIP, REALLY RUST, and RIVER ROCK. I used the Horizontal Slit Punch to punch a hole for the ribbon to thread through. My apologies for the distorted photo ... I just have a heck of a time getting good photos ... especially when River Rock is involved! Love the color, dislike photographing it! To update you on my previous post regarding Dottie K .... I found her! She responded to the post quickly, and we've been conversing via e-mail. She has a great sense of humor, and is a scrapbooker and a card maker! 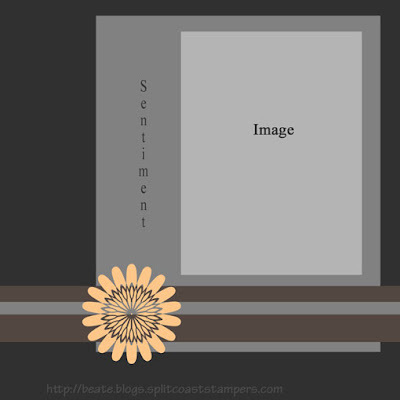 I'm trying to talk her into sharing her work with us through SCS gallery or blog! Let's hope she starts soon! WHO IN THE WORLD IS DOTTIE K ??????? You've all heard of the books, "Where's Waldo? ", right? Well, I want to know who in the world is the sweet lady that has left me very nice comments on the majority of my posts since I started my blog! When I click on Dottie K's profile, I get NO information. Dottie K, if you're out there, THANK YOU!!!!!! for reading, and for making my days with your kind comments! You are very encouraging! This card is a COMPLETE CASE of Laurie Schmidlin's card, (Just Give Me Stamps). I needed a fast "knock your socks off card" and KNEW I could find it on Laurie's blog! Last week, my brother-in-law, Rick asked me to make an anniversary card for him to give to his wife, Norene. I was honored that Rick asked me to do that, and knew it HAD to be special, as they celebrated 40 years of marriage last weekend! Norene is a stamper too, and I wanted to use a stamp set and supplies that I knew she owned. This card is so elegant, yet very easy to duplicate! The only change I made from Laurie's card was the "happy anniversary" sentiment. The sentiment and the medallion are both emossed with Black Embossing Powder. Note: Card measures 5 1/4" x 10 1/2", scored at 5 1/4". The other night, my friend (and new member of my creative team), Leah Sinatra dropped by bearing gifts! Look what Leah made for me! They are altered letter chipboard pieces to hang up in my craft room! They measure approximately 8" tall, and I'm still deciding on the perfect place to hang them...should I hang them horizontally or vertically?...etc. Leah had made another chipboard name and brought it to our last stamp class. Everyone LOVED them ... little did I know that she would turn around and make a set for me! OMG! I am so spoiled! I just love the DPs and embellishments she used! THANK YOU, LEAH!!!! Here are some close-up shots showing some of the detail Leah added to the letters. Do you all remember my friend, Paula Bartlett? She's the one that gave me the garage sale figurine in THIS post, and also the one that found the lunchobox tins for me in THIS post. Paula and Leah are sisters-in-law. Leah also brought a gift for me from Paula ... Paula's FAMOUS FRIENDSHIP BREAD! Paula, like clockwork, bakes this most incredible tasting bread every ten days! A huge labor of love! Paula has given me loaves in the past, and I am always hoping I'm on the list for the next batch! I'll never forget the first loaf she ever gave me ... Allie and I were at Paula's house, and we left to go somewhere ... we were so hungry that we were breaking off chunks of it while driving to our next destination. By the time we arrived to our destination, the loaf was about 80% gone! It is the BEST stuff! Anyway, look at this HUGE loaf she gave me this time! The photo does not do it justice ... it was perfectly baked and gorgeous! As usual, it didn't last long ... my family and I ate it within 3 days! THANK YOU, PAULA !!! 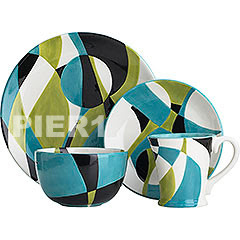 Today's SCS Inspiration Challenge 93 involved getting your inspiration from this dinnerware set from Pier One (my fav. store!). Other than that, there were no rules! I picked up on the colors of Taken With Teal, Old Olive, Basic Black and Whisper White. The dinnerware set had a retro/modern feel to it, and the Big Pieces and Little Pieces stamp sets were probably the most modern and retro style of stamp set I own. I went to the SCS Big Pieces gallery (here) for some inspiration, and ended up CASEing this card from allenjeni. I changed only a few things: a) my card is square 5 1/4" x 5 1/4", b) the obvious color scheme from the inspiration pieces, and c) the sentiment from All Holidays. The black circle with the teal flower inside is black CS punched out with the 3/4" circle punch, and the teal flower is stamped on whisper white, punched with the 1/2" circle punch, then popped up on a dimensional. Tools: CM Custom Cutting System (2 1/2" Teal Circle), Circle Punches -- 1/2", 3/4", 1", 1 3/8"
I've been a lurker on Beate's blog, Fresh and Fun, for quite sometime, and have always wanted to participate in her weekend sketch challenges. I finally made time for it last night. Beate always has such wonderful layout challenges, I just don't always have the wonderful time to participate! Although I struggled with this one, I plan to return for more! Stamps: Autumn Harvest (pg. 20 Holiday '07 Mini), Everyday Flexible Phrases (pg. 154). Notes: Card measures 5 1/4" x 5 1/4". The pumpkins are stamped with Chocolate Chip Classic Ink onto Apple Cider DP, cut out, and popped up on dimensionals (paper piercing). There is linen thread tied around the stems of the pumpkins. "Happy" and "Fall" are stamped in Chocolate Chip Classic Ink on the twill tape. It's hard to see in the photo, but there are paper piercing lines on the Chocolate Chip CS horizontal strip, above and below the DP. The leaf chipboard is covered in River Rock CS, and a sanding block was used to distress the edges. MELISSA, YOU MAKE ME HAPPY! 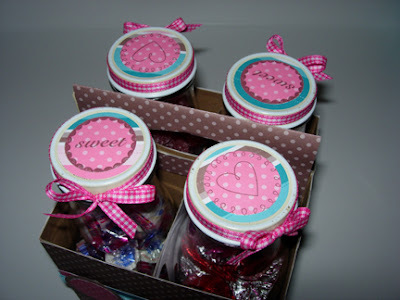 In August, Melissa Wheeler won my 10,000 hits blog candy (the Cutie Pie Altered Lunchbox Tin HERE). I received this adorable card from Melissa thanking me for the tin ... FUN mail! Melissa used the stamp set, You Make Me Happy, from the Spring '07 Mini Catalog. I just love this stamp set, and haven't used it near enough! Melissa used the color combo of So Saffron, Vintage Violet, and Cranberry Crisp. THANK YOU for the beautiful card, Melissa! I've had this project in my head for weeks, and am so excited that I was finally able to put it together yesterday! It is an Altered Starbucks 4-pack Frappacino ... the kind you purchase at your local grocery store. Recipe and directions are given below the photos. * The lids to the bottles were painted with black satin spray paint. * The Black Craft Ink Pad was used to ink up the edges of the cardboard carrier before adhering the CS. * To cover the body of the cardboard carrier, cut 2 pieces of DP 4" x 10", scored at 2 1/2" and 7 1/2". I used Scotch double stick tape to adhere DP to cardboard carrier. * To cover the middle handle section, cut one pieces of DP 4 1/4" x 5", scored at 2 1/8". For the oval shaped hole, I traced the hole with a pencil on the wrong side of the DP, and cut it out with scissors. * There are two small triangle pieces on each side of the carrier. Again, I traced them onto the wrong side of the DP, and cut them out with scissors. * The band going around the body of the carrier is the black spider web DP from Creepy Crawly and Pumpkin Pie Grosgrain Ribbon. * The images from Batty for You were stamped in Versamark onto Cardstock and embossed with Black Emboss Powder, then punched with the 1" and 1 1/4" Circle Punches. * The words dangling from the center of the cardboard carrier were punched with the Word Window Punch from the Creepy Crawly DP (the one with all the Halloween-related words). Really Rust eyelets were added to the "tags", and hang with black hemp twine from the center black grosgrain ribbon. * I chose not to decorate the glass portion of the bottles ... didn't want the CS or DP to "catch" and tear when removing and inserting the bottles into the carrier. Here is another Altered Starbucks Frappacino gift set I did back in January for Valentine's Day. I'm defenitely on the "Band Mom Sleeping Schedule"! Although Allie didn't have an early morning marching band practice this morning (because of last night's practice), I was wide awake at 5:00 a.m. So, I got some stamping time in this morning before she and Drew woke up for school. When I saw Sharon Johnson's adorable Halloween treat box, I knew I HAD to case it. 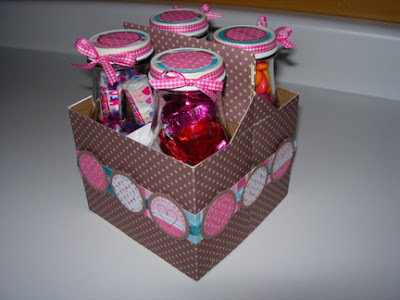 Sharon used Apple Cider DP to create her box, and it is just so-o-o cute! See Sharon's original box and great instructions for creating your own Halloween treat box HERE. Sharon is also known as notimetostamp on SCS. I've admired her work for quite sometime, and she just recently joined the blogging world. See Sharon's SCS gallery HERE. I chose Creepy Crawly DP for my box, and changed just a few other things. Sharon's instructions were GREAT ... very easy assembly! Other: Instructions for constructing this Treat Box can be found HERE at No Time To Stamp? My Stampin' Up! Upline, Barbara Welch (Creative Stampin' Spot) mailed this beautiful congratulations card to me! Fun mail! Barbara used reverse masking to create the multi-colored circles in the background. She used the stamp set Priceless (pg. 117), and cardstock in the colors of Naturals Ivory, Really Rust, Not Quite Navy, Very Vanilla, and Close to Cocoa. My favorite part of this card is the half circle of Close to Cocoa CS under the Jumbo Pewter Eyelet (pg. 189) with the Blue Bayou Double Stitched Grograin Ribbon threaded through! I just love the fall colors of this card! Recently, I've had a couple of my handmade greeting cards returned to me requiring extra postage by the United States Postal Service. They are really cracking down on what they term as nonmachinable mail. Save yourself some headaches, and purchase some $.17 stamps to add to your $.41 stamps, or purchase some of their $.58 stamps. You can purchase postage stamps online and get more information at www.usps.com. Here are the USPS's characteristics for nonmachinable mail. If you send anything through USPS with these characteristics, they require an additional $.17 postage. * It is a square letter (minimum size for square envelopes is 5 x 5 inches). * It has clasps, string, buttons, or similar closure devices. * The length divided by height is less than 1.3 or more than 2.5. OK, Stampers ... basically all those ribbons, eyelets, brads, hardware, dimensional items that we put on our cards make it bumpy, creating an uneven surface. Therefore, USPS cannot process those envelopes through their machine. Relunctantly, I'll be adding the extra $.17 postage to my handstamped cards. Thought you might want to know! Minimum Height: 3-1/2", Minimum Length: 5"
Maximum Height: 6-1/8", Maximum Length: 11-1/2"
Minimum Thickness: 0.007", Maximum Thickness: 1/4"
More tins, different style! I have been very anxious to get around to this project for quite some time! These are altered Altoid Tins, and I was inspired by the altered SU Accents & Elements tin make 'n take project many people have shown on their blogs from convention. Last Spring, Tammy and I were out garage sale-ing and found a big 'ol box of Altoid Tins. Of course, we snatched those puppies up FAST! The lady holding the garage sale was very curious as to why we would even want them! We simply replied, "crafting". She said she could never figure out why her husband saved all those Altoid Tins! She said that he eats them like candy! One man's garbage is another woman's craft project!!!! I spray painted the tins, inside and outside, with black satin spray paint. The crop-a-dile cuts through them like butter! (which creates the holes for the ribbon to go through). The ribbon is simply tied in knots on the inside to secure it in place. I also covered the back of the tins with the same Creepy Crawly DP used on the front. Several pieces of Halloween candy can easily fit into these tins. Here is a card Halloween card I did a couple of nights ago. I wasn't even going to post it, but Allie (who is very frank with her opinions about my work) liked it. Allie has a great eye for design so I figured if she liked it, it must be OK! To me, it just seems to be missing something but everytime I try to add to it, it looks too busy. I went by the same layout as the Garden Whimsy card we made at my August class (here). When I started my blog, I intended for it to be only stamping-related (I didn't want to bore anyone with personal stuff). What I didn't know is that I would meet so many incredible people that would be genuinely interested in me personally! Lately, some of you have been asking about some personal updates through e-mail, and thought I'd answer them in a quick post. * My daughter, Allie's marching band performed their first half-time show Friday night at our first home football game. Um, I think it was like 110 degrees that day! How crazy is that to be going to a football game in this heat?! Anyway, their performance was AWESOME, as always! They had just learned their first movement a week prior at band camp! That group of kids just blows me away! They are so committed and hard-working! John, my husband, is in charge of water for the band, which is a huge deal, especially in the Phoenix heat! We don't want any of the kids to drop on the field! I sold raffle tickets during the game, and Drew helped at the consession stand during half-time so the parents could watch the show. If there was a football game going on, I didn't realize it! It's all about the BAND! * My blogging and stamping may be slowed down some in the near future. My mom is coming in a week from Omaha. She will be recovering from surgery at my house for four weeks. She will not have any use of her right arm (she's right-handed), so I'll be her right arm! Looking forward to having her here! That's the Riley household update for the week ... now I MUST clean my house for tomorrow's class! I SHOULD BUY A LOTTERY TICKET! Yep, I should buy a lottery ticket because I've been on a winning streak! 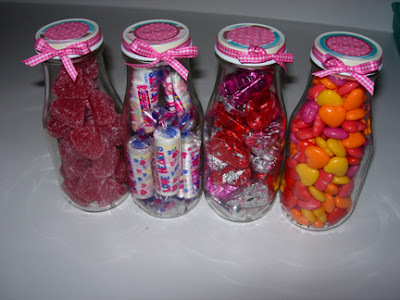 I've won TWO blog candies within a week of each other!!! WOOHOO! I'm sharing the one I received in the mail yesterday from Gena Contor of My Stampin' Garden, aka Morning Glory68 on SCS. Visit her blog, visit her SCS gallery, leave nice comments for her because she is one generous, kind lady! ... and one talented stamper to boot! Gena is the very first stamper I met when I started my blog. Here's a photo of all the goodies that came in my mail yesterday ... a gorgeous handmade card from Gena, not one but TWO clear paint cans (can't WAIT to alter them! ), two stamped can toppers, six SU inspiration sheets, two yards of beautiful ribbon, chipboard flowers, tags, and prima flowers! WOWZERS! I'm in heaven! Here is Gena's beautiful card. The silver Baroque Motif swirl and center medallion are embossed, and there is a rhinestone brad in the center. I love it! Here's a photo of Gena's card opened to show you the unique fold she used. I've never made a card with this fold before, but will have to try it now! Join the frenzy this month with Stampin' Up! 's Fall Frenzy promotion! Spend $30 in regular priced merchandise and qualify to purchase one of each of the six promotional stamp sets at 30 percent off! September 1 - September 30, 2007. Click on the name of each stamp set to view images. Click HERE for samples using these stamp sets. Don't forget another incredible special this month from Stampin' Up! ... Choose Your Family! Purchase the Demonstrator Starter Kit and receive an additional 12 Classic Ink Pads FREE! See more information HERE and HERE, or e-mail me directly! This is such a great deal, and Stampin' Up! doesn't offer it very often. Don't miss out! Today's Featured Stamper Challenge (FS30) features the gallery of Heather Pulvirenti, aka inglishrea on SCS. The idea is to view the featured stamper's gallery, case one of their cards and change at least two things about it. Here is Heather's GALLERY, her BLOG, and the HEATHER'S CARD I chose to case. I can't believe I spent time making a Christmas card when I haven't even begun making Fall and Halloween cards! Their all in my head ... just need time to put them into action! I found these self-adhesive bling stars at the Michael's $1 bin the other day, and knew they would be perfect for the top of the Christmas Tree in the Season of Joy stamp set (pg. 2-3 of the Holiday Mini). When I found Heather's card, I knew it would be a great excuse to start using my Wintergreen DP that's been calling my name for several weeks!